Conventional wisdom dictates that when a ministry needs seamless switching between multiple video sources (cameras, video playback, computer graphics, etc.) that ministry goes shopping for a dedicated, stand-alone video switcher/mixer. When that same ministry later needs a digital video editing solution they again go shopping for such a solution (computer hardware, editing software, etc.). And when the vision for video streaming inevitably arrives, once again, the ministry enters the video streaming “shopping mode” to obtain what they think/hope will be the optimum hardware and software for their streaming needs. And so it goes within thousands of churches year after year, technology after technology and shopping trip after shopping trip (click?!). But is this a la carte approach the wisest, most economical and accepted method of establishing, building and expanding your media ministry? Just say “NO!”. 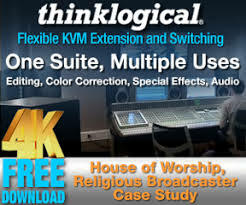 Thanks to the combination of today’s powerful PC’s and some refreshingly unconventional wisdom of a band of folks in San Antonio, TX, ministries of almost any size have the option of investing in a totally integrated turnkey solution for their video switching/projection, streaming, digital editing, and recording needs: the NewTek TriCaster BROADCAST ($11,995). I’ve been tracking with NewTek’s innovative, powerful and easy-to-use video production tools since the late 1900’s (1991+) when my video production company centered around several Amiga-based Video Toasters. Until several weeks ago I never had the opportunity to spend “quality time” up close and personal with any of NewTek’s 21st century TriCaster portable live production systems. With the 16 lb. shoe-box-sized TriCaster BROADCAST system connected and powered up in front of me I set out to discover if NewTek Inc.’s (www.NewTek.com) promise of “a production studio in a box” (with their uniquely powerful TriCaster family of products in general and their TriCaster BROADCAST system in particular) is the all-in-one portable live production solution they claim it to be and more importantly, worthy of your ministry’s serious consideration and dollars. For you impatient readers here’s a major clue in the form of a command…do not, I repeat, do NOT shop for competing solutions without first checking out NewTek’s TriCaster BROADCAST or one if it’s three siblings. (TriCaster, TriCasterPRO and TriCaster STUDIO). I’ll leave the job of communicating each product’s distinctiveness to NewTek’s over-qualified and friendly marketing and sales personnel but the single greatest feature distinction of TriCaster BROADCAST is its SDI support. In addition to the TriCaster BROADCAST unit, my review system included a keyboard, mouse, operator’s manual, reviewer’s guide and “crazy NewTek toy” (airplane). Windows activation and product registration were required which went refreshingly smooth, and before I knew it, I was looking at the well-designed, please-click-me-and-see-what-happens main interface with four primary tabs across the top labeled “Live Production”, “Capture Media”, “Edit Media” and “Edit Text”. I quickly connected two camcorders to two of the six available composite inputs (SDI, component or Y/C over BNC inputs also included) and the unit instantly recognized the camera signals allowing me to experiment with the system’s real-time video switching effects, capabilities and workflow. Since the three-bus interface (Effects, Live and Preview) matches that of most stand-alone video switchers (complete with virtual T-bar), the learning curve was non-existent for anyone with previous video switching experience. Transitions were responsive, smooth and professional looking. For those who simply do not want to use a mouse and keyboard for live video production NewTek offers the LiveControl physical switching panel (optional). The system’s two built-in DDRs (Digital Disk Recorders) with on-screen preview monitors, worked flawlessly as I captured (via the unit’s 6-pin Firewire jack) and played back miniDV footage. With “cue” selected on either DDR, video clips start playing instantly upon transition to the DDR, which goes a long way towards our goal of integrating prerecorded media seamlessly into ministry settings. The manner in which video clips began playing instantly within their bin icon by a mere mouse roll over merits a “Cool” with a capital “C”. TriCaster BROADCAST has a recording capacity of 20 hours of AVI footage which provides ample space for archiving multiple projects and/or services. Overlaying high-quality text and graphics from TriCaster BROADCAST’s abundant templates and presets was a snap. One of the first things I look for in new video production programs and products is the quality and quantity of included templates, graphics and media content. NewTek did not disappoint. Included lower thirds, overlays and full-page graphics definitely have that network quality look. Although I wasn’t set up to do live video streaming with TriCaster BROADCAST here at my studio I did experience its real-time video web streaming capabilities on-location at a church in Las Vegas recently. Nice. The long list of push and pull preset frame rates, resolutions and bit rates make selecting the appropriate video streams quick and painless. And the easy-to-access “Stream Live Output” button in the bottom left corner of the Live Production interface is simply…simple. One-button recording of the live production to the internal hard drive as a full-resolution video file is also the picture of simplicity. Easily the most captivating and imagination-stimulating feature of TriCaster BROADCAST is LiveSet which allows you to place on-camera talent (via green screen) into professional, high-quality multi-camera virtual sets complete with shadows, reflections and video sources displayed on virtual LCD panels. Your own LiveSets can be created with a series of LiveSet creation applications. This feature alone is almost worth the price of admission. Another favorite capability of TriCaster BROADCAST is its ability to import, scale and display a computer-generated VGA source from an external computer which NewTek dubs iVGA. 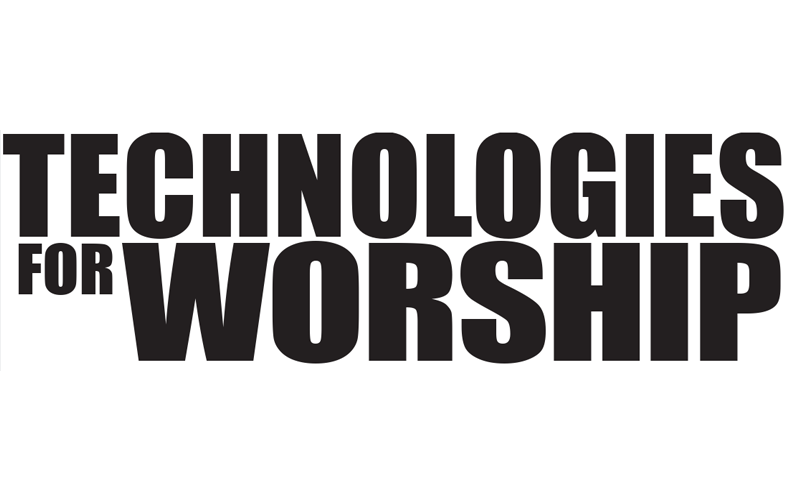 This is especially helpful to churches and allows a secondary computer display (the program output of their presentation software) to be processed, seamlessly transitioned and projected, recorded or streamed quickly and cleanly. No external scaler or scan converter needed. Though somewhat downplayed by NewTek’s marketing material (in my humble-yet-digital opinion) TriCaster BROADCAST includes a very capable if not somewhat unique digital video editing solution based on their stand alone Speed Edit. This video editing program is billed as the world’s fastest video editor. It offers Storyboard or Timeline views and an all-tracks-can-by-any-track (video, graphics, pictures, music, etc.) approach. My word count is nearly exhausted but much remains unsaid about this product which is really a BUNDLE of unique products. My review system performed excellently and there is a lot to like about this powerful-yet-volunteer-friendly system. 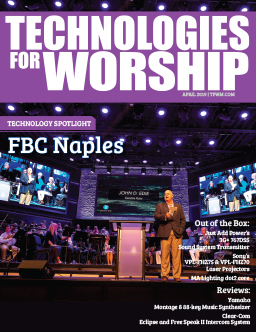 If your ministry is looking for a suite of solutions for video projection, recording, editing, graphics display and streaming you definitely will want to check out NewTek’s TriCaster BROADCAST portable live production system. That’s my storyboard and I’m stickin’ to it.